Dr. Erika Enos, a registered Naturopathic Doctor in the state of Colorado, strives to understand (and help her patients to understand) and correct health issues by identifying their root cause. She does this through a unique blend of the best of naturopathic medicine, biotherapeutic drainage, and anthroposophic medicine. Dr. Enos learned early in her career that curiosity and constantly asking “why” are the most powerful tools to truly understanding and treating patients and their problems. She is passionate about changing the disease-centered view that dominates medical care in modern America, focusing on healthcare and optimizing wellness rather than disease management. In this new paradigm the doctor-patient relationship is a long-term, trust-centered, and collaborative partnership. 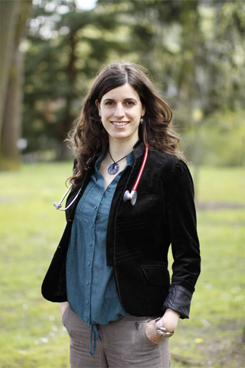 Dr. Enos brings her medical and naturopathic expertise to guide, coach, and inspire you; you bring your expert knowledge of you, your willingness, and your enthusiasm for living life to its fullest. Dr. Enos’ patients often say that she is not only a good doctor, but also a kind, compassionate, and effective teacher. Dr. Enos is a graduate of the National College of Natural Medicine (NCNM), the oldest accredited naturopathic college in the United States. After graduation, Dr. Enos completed a competitive, full-time residency with NCNM, which included working in the school’s diverse clinics as well as rotations with specialists and experts in the Portland community. Prior to discovering naturopathic medicine, Dr. Enos double-majored in Art Practice and Art History at the University of California, Berkley. She believes that the practice of medicine is an art, and she brings to it the sensitivity and creativity of an artist as well as the investigative skills and curiosity of a historian. When not practicing medicine, Dr. Enos enjoys practicing many forms of yoga, painting, cooking, and hiking.